← I’m sorry — did you say something? The rain was coming down steady all day, so Rory and I opted for the Firefly marathon on ScyFy Channel. Nathan Fillion does brighten a day. 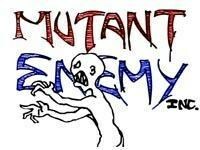 After watching episode after episode, I came to apreciate the animation — or lack there of — in Joss Whedon’s Mutant Enemy production company logo. It looks like it was sketched on a napkin…the ghoul clumsily lurching across the screen while a drunken voice moans off-screen. I have watched a lot of action flicks with CGI and super slick graphics, but this primitive artwork is my fav. Nathan Fillion, too. This entry was posted in Celebrities, Commentary, Entertainment, Humor, Movies, Television and tagged design, Firefly, Humor, logo, Movies, Nathan Fillion, scifi. Bookmark the permalink.